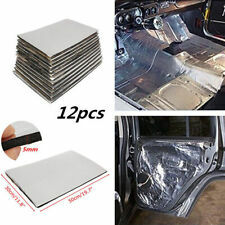 Heat Insulation Sound Deadener Noise Reduce Muffler Floor Engine Roof 12"x39"
They provide outstanding value, with a silky smooth texture, created from premium nylon yarn. Velourtex mats are equipped with anchoring devices to keep them safely in place. Add a nice touch to the interior of your 1970-1977 Chevrolet Chevelle with Lloyd Mats Velourtex floor mats.Sold as a pair of front floor mats with CHEVELLE in your choice of embroidery thread color and on your choice of carpet color. They provide outstanding value, with a silky smooth texture, created from premium nylon yarn. Velourtex mats are equipped with anchoring devices to keep them safely in place. Add a nice touch to the interior of your 1964-1967 Chevrolet Chevelle with Lloyd Mats Velourtex floor mats.Sold as a pair of front floor mats with CHEVELLE in your choice of embroidery thread color and on your choice of carpet color. NEW 2-PIECE MOLDED BLACK LOOP CARPET WITH JUTE PADDING. NEW BLACK MOLDED LOOP CARPET. Jute Padding attached to the underside. 2-piece (front and rear) like original factory carpet. This carpet set has the following features. Door Sill Plates. New Reproduction Door Sill Plates. Crisp & Clean Stamping. GM A-Body: Chevelle - LeMans - Cutlass - Skylark. 1968 - 1972 Chevrolet: Chevelle / Malibu. Fits the following2 Door Models. $Full-length - Runs from the firewall to the back seat. Each side measures approximately 60-3/4" x 26- 1/2". These pans do not include the entire transmission tunnel. Die-stamped from Heavy Gauge steel. Includes left and right sides. Carpet sets are not a “One Size Fits All”. Carpet sets are made specifically for your application. This carpet set has the following features If there is a problem, we will do our best to rectify the situation. They provide outstanding value, with a silky smooth texture, created from premium nylon yarn. Velourtex mats are equipped with anchoring devices to keep them safely in place. Add a nice touch to the interior of your 1964 & Up Malibu with Lloyd Mats Velourtex floor mats.Sold as a pair of front floor mats with your choice of the Malibu word for your year embroidered in your choice of thread color and o n your choice of carpet color. They provide outstanding value, with a silky smooth texture, created from premium nylon yarn. Velourtex mats are equipped with anchoring devices to keep them safely in place. 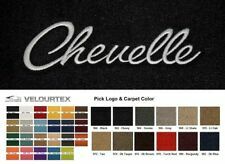 These 1966-1967 Chevrolet Chevelle Lloyd Mats Velourtex 4pc grey floor mats have the 1970-1977 CHEVELLE script font logo instead of the correct 1964-1967 Chevelle block font logo.this is a a 4pc set on their 966 Grey carpet color with the logos embroidered in 931 bright blue thread on both front mats with the 531 Bright Blue Optional premium vinyl edge binding on all 4 mats as shown. 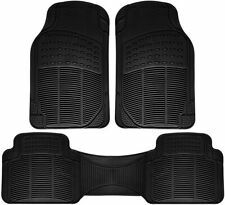 VELOURTEX™4Piece Floor Mat Set. VELOURTEX Features Velourtex starts with a high quality nylon yarn (20 oz. LLOYD MATS. 1964 to 1969 Chevrolet Chevelle. Silver Chevelle Lettering embroidered on front mats only. ). Chevelle / Malibu. 1964 - 1967 Chevrolet: Chevelle / Malibu - All Models. Rubber Floor Mat Set. Left Front Provision for Floor Mounted Gas Pedal. Left & Right Rears Flare Out at the rear to match the floor pan design. 1971 Chevy Chevelle Parking Light Lamp Lens Bezels. Pair - Both Right and Left Side. FITS 1968-1972 CHEVROLET CHEVELLE, MALIBU, MONTE CARLO. LOGO: SS 396 ( RED ). NEW EMBROIDERED FLOOR MATS. COLOR: BLUE ( 80/20 LOOP ). They provide outstanding value, with a silky smooth texture, created from premium nylon yarn. Velourtex mats are equipped with anchoring devices to keep them safely in place. Add a nice touch to the interior of your 1964-1972 Chevrolet Chevelle SS with Lloyd Mats Velourtex floor mats.Sold as a pair of front floor mats with SS in your choice of embroidery thread color and on your choice of carpet color. Fits AUTOMATIC models only Fits cars with or without console. 2-piece (front and rear) like original factory carpet. Door Sill Plates. GM A-Body: Chevelle - LeMans - Cutlass - Skylark. Very Crisp & Clean Stamping. 1968 - 1972 Chevrolet: Chevelle / Malibu. 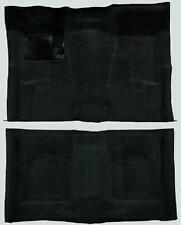 Fits the following2 Door Models 1968 - 1972 Pontiac: GTO - LeMans - Tempest. And include the center transmission tunnel area. 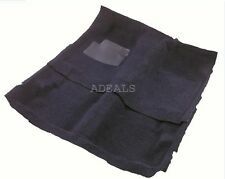 68-72 GM A-BODY FULL LENGTH FLOOR PANS. NEW PAIR OF FULL-LENGTH FLOOR PANS. These pans are made with all-new tooling. No exceptions, sorry. They provide outstanding value, with a silky smooth texture, created from premium nylon yarn. Velourtex mats are equipped with anchoring devices to keep them safely in place. Add a nice touch to the interior of your 1953 & Up Chevrolet with Lloyd Mats Velourtex floor mats.